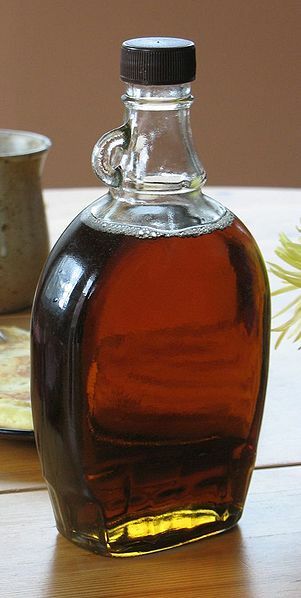 Maple syrup is a sweetener made from the sap of some maple trees. In cold climate areas, these trees store sugar in their roots before the winter and the sap which rises in the spring can be tapped and concentrated. Quebec, Canada, produces most of the world's supply of maple syrup. The United States is the only other major producer and the leading consumer. Maple syrup is most often eaten with waffles, pancakes, oatmeal, crumpets and French toast. It is sometimes used as an ingredient in baking, the making of candy, preparing desserts, or as a sugar source and flavoring agent in making beer. Sucrose is the most prevalent sugar in maple syrup. Left: Bottled maple syrup produced in Quebec. It was first collected and used by Native Americans and was later adopted by European settlers. Maple syrup is sometimes boiled down further to make maple sugar, a hard candy usually sold in pressed blocks, and maple taffy. Intermediate levels of boiling can also be used to create various intermediate products, including maple cream (less hard and granular than maple sugar) and maple butter (creamy, with a consistency slightly less thick than peanut butter). During the production season in New England, a traditional delicacy known as "sugar-on-snow" is often prepared by drizzling superheated maple syrup over snow or shaved ice, resulting in a chewy taffy-like confection. Owing to the sugar maple tree's predominance in southeastern Canada (where Europeans settled in what was to become Canada), its leaf has come to symbolize the country, and is depicted on its flag. 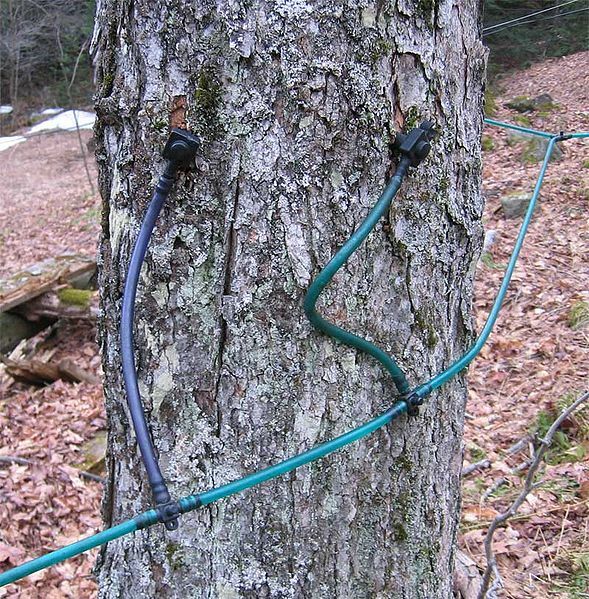 Left: Two taps in a maple tree, using plastic tubing for sap collection.